What are the University Bid limits? According to University Policy, it is a requirement that purchases totaling over $5000 are sent out to bid. These bids are sent to 3 or more known suppliers. 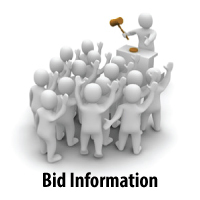 Bids and RFP’s that total over $50,000 are listed on our website under Current Bids. How do I get on the University Bid List? There is no “bid list” maintained at the University of Utah at this time, however, if you would like to contact the buyer with your information you are certainly welcome to do so. You can review current and past bids here. We encourage Small and Minority Businesses as well as Large Corporations to Submit bids to the University of Utah. After you see an advertisement that you would like to respond to, visit the BidSync Online Bid System here and register for the bid your company is interested in. Our advertised Bids and RFP’s are opened electronically on Thursday’s at 2:00 PM and so must be submitted and finalized before that time, unless specified differently. How do I find out the results of a bid if I can’t go to the bid opening? After the Bid/RFP has been opened, suppliers should visit BidSync to see the results. Or, you can contact the buyer who is responsible for that particular bid by calling (801)581-7241 and giving the bid number and due date for that particular bid. Purchases between $5000 and $50,000:University Policy requires those purchases over $5000 and under $50,000 to get bids from 3 or more known suppliers. These bids are usually processed through the RFQ process via facsimile. There is no formal “bid list” maintained by the University of Utah at this time, however, you may contact the buyer with your information. Purchases under $5000:These purchases are generally handled by the departments through several different methods including the VISA Purchasing Card, Limited Purchase Orders, Limited Purchase Checks and sometimes General Purchase Orders. There are some things that are considered restricted including compressed gasses, radioactive isotopes, DEA restricted purchases and live animal purchases.